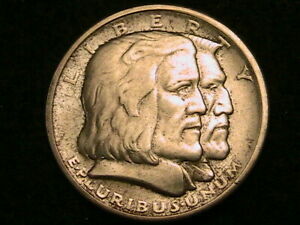 1936 was the year of the commemorative half dollar. 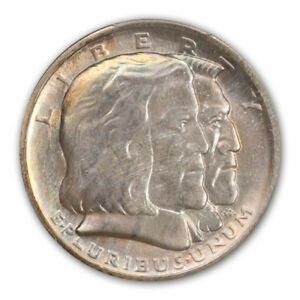 As a speculative mania developed in these special coins, no less than 16 new designs appeared. 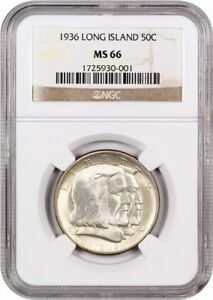 In addition, several existing types were reissued with the date 1936, since their authorized mintages had not yet been reached. In all, collectors active in that year could chose from a total of 21 different commemorative coins bearing the current date, a record not likely to ever be broken. 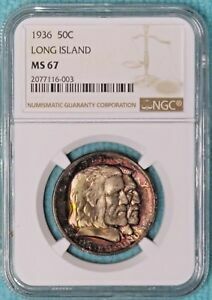 Almost lost among this bewildering array of special coins was an unpretentious issue marking the 300th anniversary of European settlement on New York's Long Island. To everyone's surprise, it proved one of the best selling and least controversial offerings to come out of that memorable year. The first white people to establish a community on Long Island were Dutch immigrants who arrived in 1636. A deal was soon struck with the 13 Algonquin tribes inhabiting the island, securing it for the Netherlands. In reference to its size (118 miles in length), the Dutch chose to call it Lange Eylandt (Long Island). Their small settlement on the southwestern shore of the island they named Breuckelin after a town in Holland. This little village on Jamaica Bay would ultimately be renamed Brooklyn, reflecting the growing English population which gradually came to unseat the Dutch. Although resentment against the encroaching English grew, there was little the Dutch could do in the long run, since their own government in Holland proved quite miserly in providing for the defense of its New World lands. Briefly recaptured by the Dutch during their 1673 war with England, a peace settlement the following year returned Long Island to the English, who retained control until the end of the War of Independence in 1783, when it was surrendered to the Americans. To mark the 300th anniversary of the first European settlement, a Long Island Tercentenary Committee was formed with Louis C. Wills as its chairman. 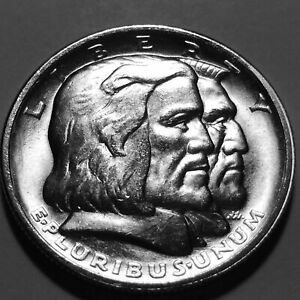 As occurred so often with such organizations, the idea was to have a commemorative coin issued as a means of defraying the cost of the celebration; and, as with most such plans, they were made far too late. 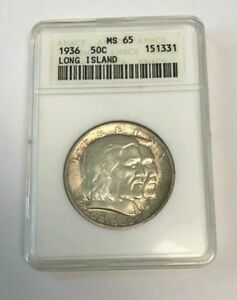 The Long Island Tercentenary Celebration was slated for May of 1936, yet a bill providing for the mintage of 100,000 coins to mark this event wasn't passed until April 13 of that year. Sensing the urgency of their situation, the Committee had already assigned the task of preparing models to young Howard Kenneth Weinman, the son of famed sculptor and medallist Adolph Alexander Weinman, creator of the Winged Liberty or "Mercury" dime and the Walking Liberty half dollar. This no doubt eased the approval process, as the elder Weinman had recently served as the sculptor member of the Commission of Fine Arts, and he was familiar to his successor on the Commission, Lee Lawrie. Nevertheless, young Weinman wrote to the Commission's secretary, H. P. Caemmerer requesting instructions on how to proceed with his assignment. The secretary replied that a photograph of Weinman's preliminary models should be sent to Lee Lawrie for his inspection prior to the next meeting of the full Commission. 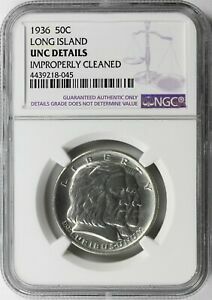 Reminding the young man of his father's extensive experience in dealing with the U. S. Mint, Caemerrer added "Of course, I need not tell you what the procedure is to complete the models for presentation to the Director of the Mint. Your Father has so often made models for the Mint that he can give you complete information on that point . . ." Mr. Lawrie was generally quite satisfied with Weinman's models, although a few minor changes were requested by the Commission before it gave final approval. 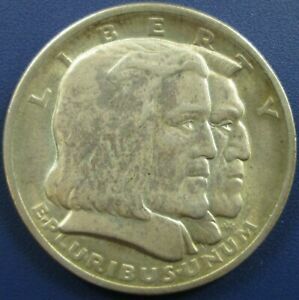 These included placing the motto IN GOD WE TRUST on the reverse of the coin and moving the inscription HALF DOLLAR from its location near the reverse border at the 3 o'clock position to a more prominent placement below the ship. The first change was indeed accomplished, but the second was never made, probably because there simply wasn't room to fit the coin's value below the ship. 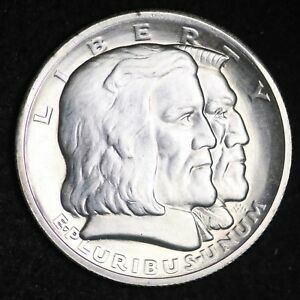 As issued, the coin is remarkably similar to Weinman's original models. 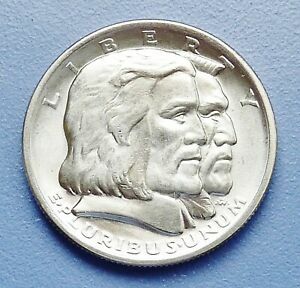 The obverse of the Long Island half dollar features a right-facing bust of a male Dutch colonist overlapping a similar bust of an Algonquin male. These portraits have been derisively described as two boxers because of their lantern jaws and prominent noses. 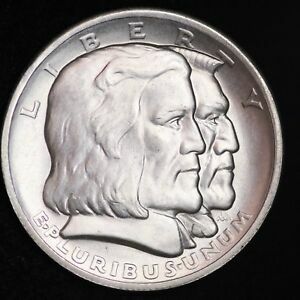 Above the men in a peripheral arc is the legend LIBERTY, while the motto E PLURIBUS UNUM appears below. Underneath the Indian's chin is Weinman's monogram, a letter H atop letter W, which looks quite similar to his father's monogram AW. The reverse is dominated by a right-facing profile view of a 17th-century ship under full sail, although critics have noted that it seems to be heading toward Holland rather than America. It travels upon a scroll-like sea into which IN GOD WE TRUST has been incused (this motto was added by U. S. Mint Chief Engraver John R. Sinnock). Written in a single, long semicircle around the upper periphery is UNITED STATES OF AMERICA HALF DOLLAR. 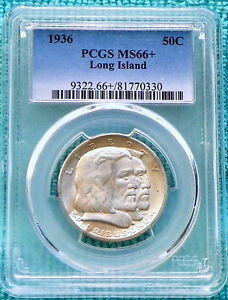 Arranged compactly in three lines below the sea are the date 1936 and the title LONG ISLAND TERCENTENARY. Despite the urgent need to produce this issue quickly, the final models were not ready until late June of 1936, although they were speedily approved by the Commission of Fine Arts. 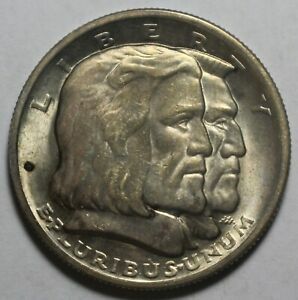 As the Mint was nearly overwhelmed with so many commemorative coin projects, the models were sent to the Medallic Art Company for reduction to hubs. It was not until August that the Philadelphia Mint was able to coin the 100,000 pieces authorized, striking an additional 53 coins which were reserved for assay and later destroyed. 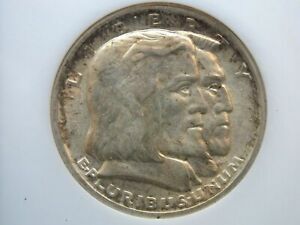 Despite their arriving too late for the May celebration, these coins sold quite well at $1 apiece during the period that they were available; all but 18,227 of the halves were distributed by local banks before arrival of the April 13, 1937 cutoff date (frustrated by commemorative issues that were marketed year after year, Congress had written into the law authorizing this issue that their sale would terminate one year after enactment). Specific quantities were initially allocated to each of the four Long Island counties on the basis of population. 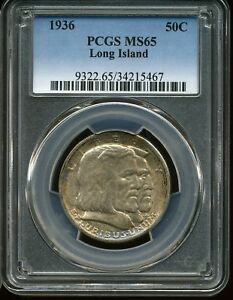 The greatest number of coins went to Kings County (Brooklyn), where many were sold from an office at the Brooklyn Eagle newspaper. 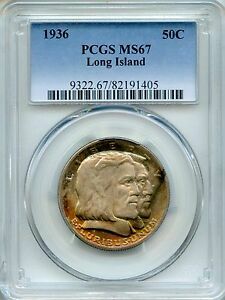 After the remaining coins were melted, a net mintage of 81,773 pieces was recorded for the Long Island half, making it one of the better sellers among single-variety coins. 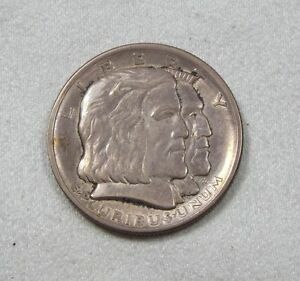 The halves were carelessly handled at the Mint, by the Committee that sold them and, apparently, by the many non-numismatists who bought them at the time of issue. 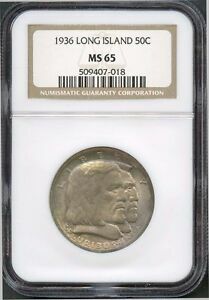 Consequently, a number of the coins show numerous nicks and abrasions, although very few if any were actually circulated as money. 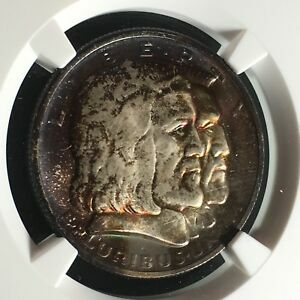 Most coins encountered today will grade from AU-50 through MS-64. 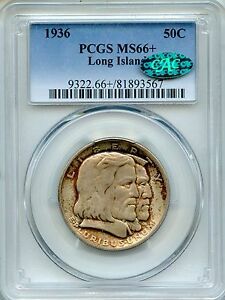 With such a large mintage, better examples grading MS-65 are available, but those in higher grades are quite scarce. 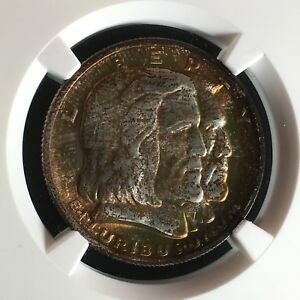 The luster on coins of this type ranges from dull and satiny to brilliant and flashy. Most examples are well struck. Hoards of 2,000 to 3,000 coins were known in the 1950s, and smaller hoards may yet exist. Points to check for wear include the settler's cheekbone and the ship's mainsail (the one at center). 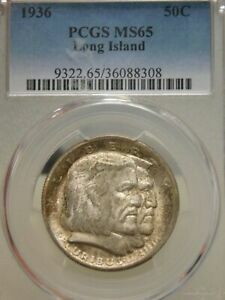 These coins were sold by Long Island banks in generic coin envelopes (for single coins) or unprinted cardboard holders (for up to five coins per holder). Mailing envelopes were imprinted with the name of the Committee and the National City Bank of Brooklyn. Scarcer are the blue presentation boxes embossed LONG ISLAND TERCENTENARY COMMITTEE TO with the recipient's name following. These are highly prized. 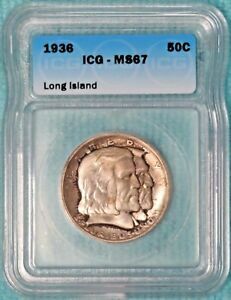 1936 LONG ISLAND COMMEMORATIVE HALF DOLLAR 50C ANACS MS64 ECC&C INC.